When the US meets Germany this afternoon, it may be a brawl in Brazil. Here, five bratwurst and five burger dishes worth fighting over. Suzanne Goin’s terrific salad is made with citrus–spiced red cabbage, bratwurst and a mustardy vinaigrette. A slightly off-dry German Riesling pairs perfectly with this dish from the Pfalz region. Summer squash, piquant peperoncini and sausage make this the ultimate summer pizza. This delicious sandwich features hearty hoagie rolls stuffed with bratwurst, juicy pastrami and Swiss cheese. Upgrade the classic pasta salad by adding grilled bratwurst. 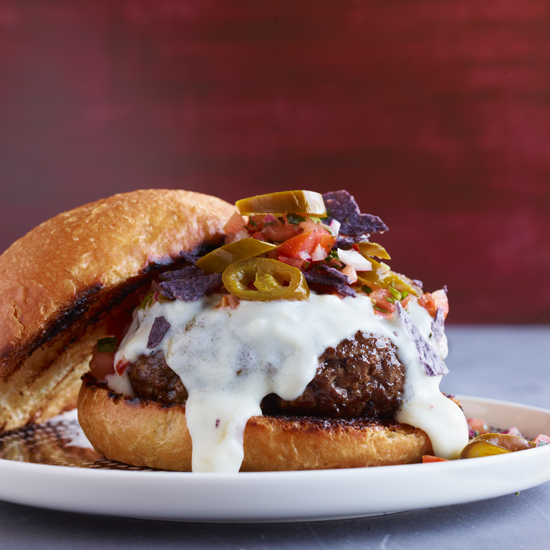 Dried pasilla chiles and molasses add smoky-sweetness to the ketchup on these juicy beef burgers. Bobby Flay’s incredible burgers were inspired by the state’s love for BBQ. These complex-tasting burgers are made by mixing ground beef chuck with bacon, scallions and mint. What’s better than a cheeseburger? One topped with nacho cheese sauce, salsa and tortilla chips. Sweet-and-sour red onion compote tops these juicy burgers.